One upon a time, pianists like Paul Bley were blazing trails. Almost 50 years later, Closer still sounds kind of gutsy. 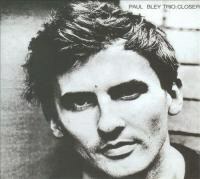 Closer is a reissue from 1965, a time when Paul Bley was recording with bassist Steve Swallow and drummer Barry Altschul. Bley had been recording his own records for quite some time leading up to this point, yet Closer is regarded as a new beginning for the jazz pianist who used to provide such elegaic keystrokes for Jim Giuffre's trio. The album is a brief tour of what it meant to be a piano trio back then. There was the hard bop ("Start"), the wonky modernism ("Sideways Mexico" and "Batterie"), the moonlit ballads ("Closer") and the unabashedly lyrical melodies ("Ida Lupino"). In hindsight, Closer was probably a gutsy record, but it doesn't get discussed much these days since Cecil Taylor came along with Unit Structures the following year and scared off many of modern jazz's potential fans. But when I say the album is a "brief" tour of this kind of jazz, I mean it. It doesn't even clear the 29-minute mark. The opportunity was ripe for ESP to make this a twofer. The album prior to this, the crazy Barrage, would have made for an interesting pairing with Closer.